Sooke's fishing is hot and cold these days, some good days, some slow days. Dave from Ocean Dreams Fishing Charters reports that he's been doing quite well lately, with some pretty spectacular days thrown in. There's been a lot of feeder chinooks in Sooke waters, with some decent size ones into the teens. 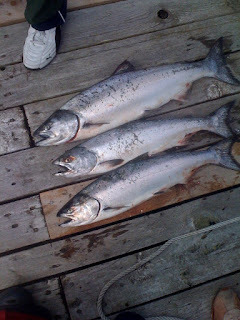 This photo is from a couple of people who had never fished before, caught these ones at first light in the Sooke harbour mouth area, fishing at 90 feet with hootchies. But the real action has been for coho, today catching 16 and 14 pound hatchery coho keepers, plus at least 10 wild ones that had to be thrown back. (Starting October 1st, anglers can keep one wild coho in Sooke waters) Dave said he had multiple fish on several times, two double headers and another two triple headers. That's great action! Below is a picture of Dave and a happy guest with a 25 pounder! For halibut, a few reports of nice fish caught at Jordan River, including a 60 pounder. 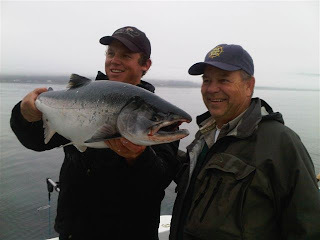 As well, one report of a 30 pounder caught drift fishing right off the Sooke Bluffs. So if they are being caught on the drift, either someone got lucky and dropped the gear right on the fish's head, or there's lots of them down there. The weather is also hit and miss these days, starting to rain a bit. But in general it has been quite mild and not too much wind ... so get out there and enjoy some fishing before the winter weather arrives!